"Lake Street businesses are about to celebrate a successful year since opening last Summer," proclaims Katy Larsen. "Friends of The Agora Borealis, Iarchitecture, Vintage Design Group, LLC, and Bears on Fairfield will flood the streets Fri, July 24, for an evening of local music, art, and food. There will also be a Cash Bar. Otherwise it is a free event." Zombee Candle and Coven Co.
Official after party at Bears on Fairfield. "Highland Jazz and Blues Festival headliner, Papa Mali, is bringing Big Chief Monk Boudreaux from New Orleans along with a few other special guests for an All Star Super Jam," says Kelly Rich about the 2015 fest on Sat, Sept 19, noon to 5 pm. Additionally, look for zeitgeist food and existential acts in abundance on the 2 stages. 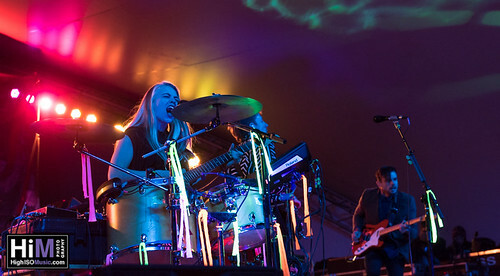 Launched in 2003, the Festival has grown from a handful of bands and a crowd of 500-1,000 to a gathering including two stages, ten bands, posters, t-shirts, food and art sales, and 10,000 music fans in Highland area’s hilly Columbia Park. 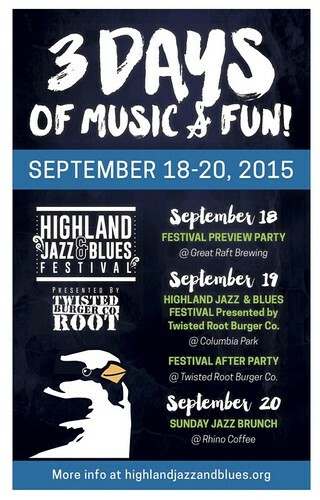 The annual Festival is a gift to the community from the Highland Area Partnership doing business as the Highland Jazz & Blues Festival Presented by Twisted Root. Proceeds from poster, t-shirt, and beverage sales, donations, and sponsorships are used to bring the Festival back each year. Highland Jazz & Blues Festival, PO Box 44292, Shreveport, LA 71134. Says the inimitable chef and musician Gordon Nurse: "Caribbean! Nite! @ Bears @ 1401. Fairfield. $2 Tuesday Specials. Great Caribbean Faire! And the amazing M.C. Behind D. bar! La D. D. Lah D. Dah. B. Irie music. Irie Vibe." Food highly recommended. Live music, too. The Common Culture Week Studio Tour of portraits, landscapes, skulls, boars and bats is a collaboration of the Shreveport Regional Arts Council (SRAC), Bossier Arts Council (BAC) and the Highland Open Studio Tour Sundays (HOSTS), says Pam Atchison. It is designed to stimulate sales of art. "Over 60 artists will open their studio doors to showcase their work. 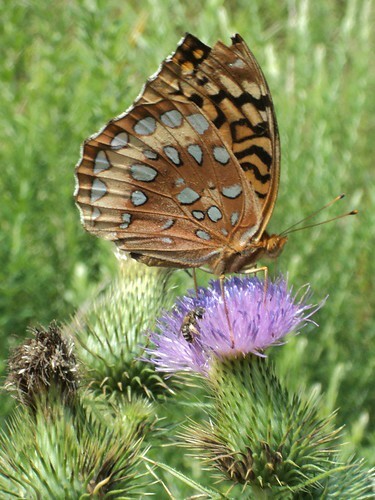 Bike, walk or drive the Tour for free or," says Atchison, "Hitch A Ride with SRAC. Join a customized collectible artist tour! Box Lunch & Drinks provided. Party at the exclusive Artist & Collector wrap-up." Ride, lunch and after party: $50.00/ person. 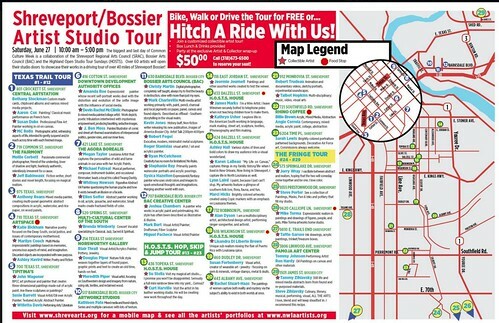 (318) 673-6500 to reserve your seat in a driving tour of over 40 miles of Shreveport Bossier. One place collectors are welcome in South Highlands is the house and studio of Talbot Hopkins and Robert Trudeau, 912 Monrovia St. See the 8X10 oil above, Les Poires d'Or ($650), and more like it by Talbot. 318 272 6045. 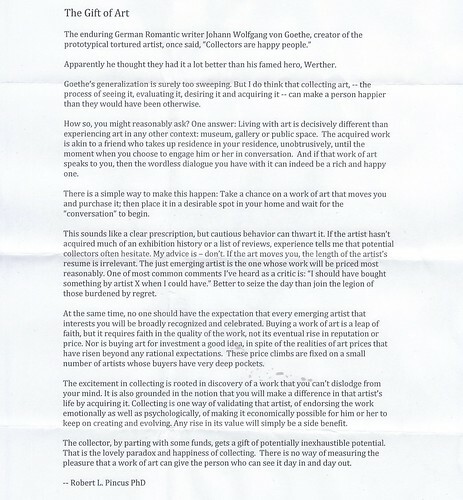 Robert Pincus, arts writer and author from San Diego, offered these thoughts about collecting art at a symposium sponsored by Shreveport Regional Arts Council. Hope you will read his words. They resonated well with Talbot and myself, avowed artists as well as collectors. Then, if you are moved at all, go spend a few more dollars on a another piece of art. Yes? 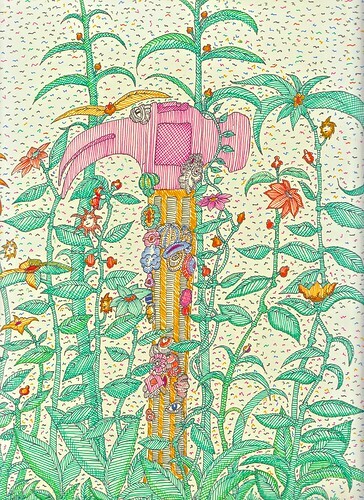 At top: "Pink Hammer," pen and inks, 2014, Robert E Trudeau. 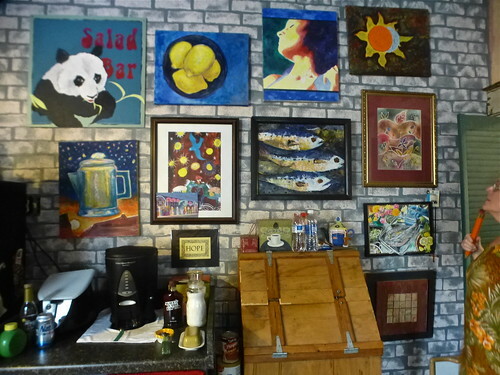 To be seen and sold Sat, June 26, during the Artist Studio Tour at 912 Monrovia St, Shreveport, or by messaging 318 272 6045. Inspired by Clyde Connell's papier mache-encrusted art hammer. It is subtitled, Pray to God but Hammer Away. 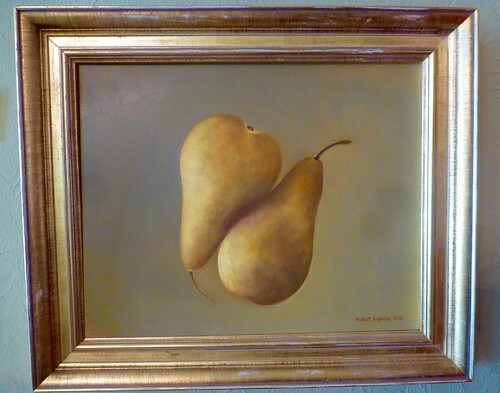 Also at 912 Monrovia St on the Sat tour will be oil paintings by Talbot Hopkins Trudeau. 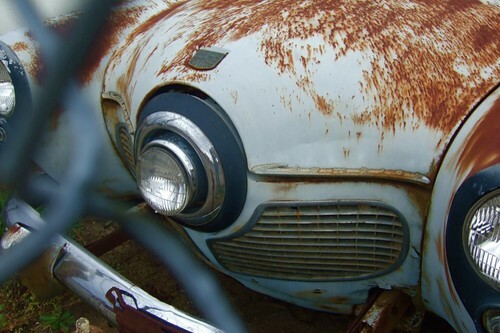 And you can enoy a visit to her charming garage-apartment studio. 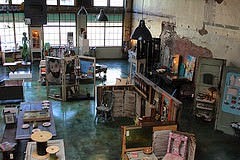 The Biology & Art Exploration Program is the latest at Rainforest Art Foundation, 710 Travis St, downtown Shreveport. "Our first program of the Biology and Art exploration is designed for kids aged 3-10 (however all ages are welcome) and will be taking place on Thursdays in July (excluding July 2). This is a free program that includes 5 different stations as part of a different theme each week designed to help kids use both the right and left brain to master concepts in art and science," says Ashley Purland. "We are looking for sponsorships for BAEP Summer 2015," continues Purland. "We are asking local businesses to donate $50 to go towards supplies for one of the days. Your sponsorship would get recognition for your business on social media, our website, our donor tree in our building, and on site for the day." Performance artists will take the historic stage at Municipal Auditorium, Shreveport, on Tues, June 23, says Pam Atchison, in a Common Culture Week showcase sponsored by Shreveport Regional Arts Council. From spoken word by Willetta to modern dance from Inter City Row Modern Dance and Louisiana Dance Collective, to musical groups Airheart, Twang Darkly and Tchai, the range of acts presenting brief samples of their work is like okra to souffle'. The evening opens with Destiny: Hope, a comic chamber opera about Miley Cyrus written by talented composer Costas Dafnis. The evening will close with remarks and a Best Of award to be given by San Diego arts critic Anne Marie Welsh. 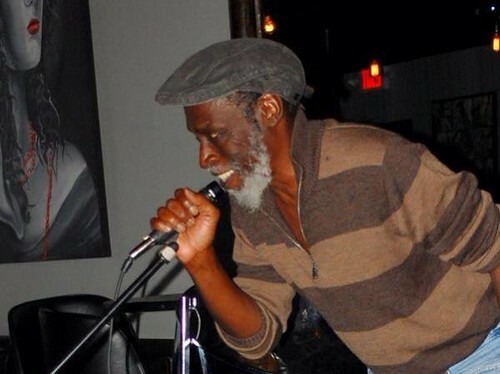 In the photo above: Medjaisle Williams, member of the Art in the Hood All Stars, performing with Tchai on June 23. Performance Showcase schedule of acts. One of Shreveport's most capable jazz performers is Trevarri Huff-Boone, a 20 year-old who is studying music at Loyola University, New Orleans. While a tenor sax is his constant companion, he plays flute and composes on piano. Trevarri has performed at shows and churches across Shreveport since he was a child; he graduated from Caddo Magnet HS. 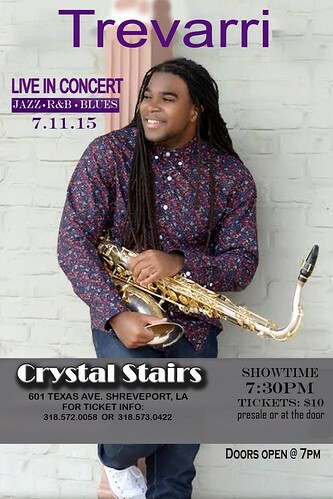 His show is Sat, July 11, at 7:30pm (doors will open at 7), at Crystal Stairs Restaurant, 601 Texas St.
"You will hear some of Trevarri's favorite songs, ranging from Jazz (think Coltrane and Davis) to R&B. 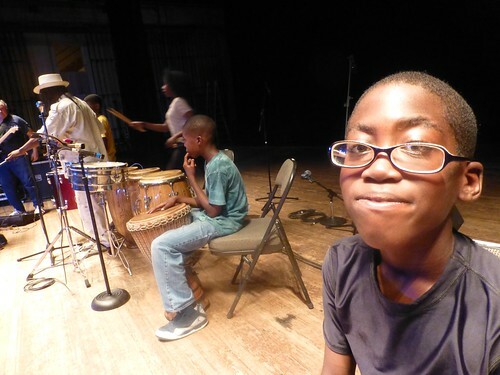 All ages are welcome at the concert and it will also be recorded," says Kawanya Huff. This summer Tre' has performed in the Jazz Series at the noted New Orleans music venue Howlin' Wolf, at the Good Times Fest in Shreveport and numerous private events. He will perform briefly on Tues, June 23, at Municipal Auditorium. As part of the art collective Tchai he will be blowing tenor in the Performing Arts Showcase produced by Shreveport Regional Arts Council. Information on Tre: 318-572-0058 or 318-573-0422. Blayne Weaver, a Bossier native who is a highly-charged movie actor-director-writer, also loves the stage. 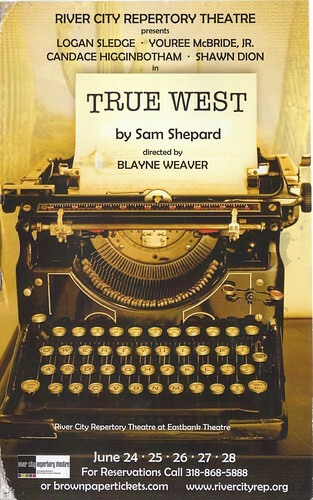 It is fair to say that expectations will be high for an evening of wild Sam Shepard drama when Weaver releases Logan Sledge, Youree McBride, Jr, Shawn Dion and Candace Higginbotham into the mythical desert of True West. See more on Weaver at River City Rep.
June 24-25-26-27 at 7:30 pm; June 28 at 3 pm. Tickets, $35, 20, 10. Online tickets. Box office: 318-868-5888 Mon - Sat, 11am - 4 pm. Well. Seems the True West script is online. At the Agora Borealis, 421 Lake St, proprietor and art enthusiast Katy Larsen says, "numerous artists have reduced select artwork 15-50% off for the month of June. Come in soon to snag these hot deals while they last." Agora B: sale continues Jun 6 - June 30. Tues - Sat, 10 am to 6 pm. (318) 268-3011. One of the Bayou State's most vibrant bands, Givers are based in Lafayette. Their summer tour takes them to Wakarusa and other big fests but on Thurs, June 4, they perform upon the boards at Bears Fairfield. Givers jammin' with blinggy rhymer in London. Farmers Markets at Provenance Community for Summer 2015 feature fresh produce and meats from farmers all around Louisiana, East Texas, & Southern Arkansas, handmade crafts, local art, ready to eat food, and much more, says Sarah Lowder. Live Music at each market and Face Painting (Saturday only). The markets and concerts will take place in an outdoor park in the Provenance neighborhood, which offers a beautiful outdoor setting with many trees. These events are Free and Open to the public. 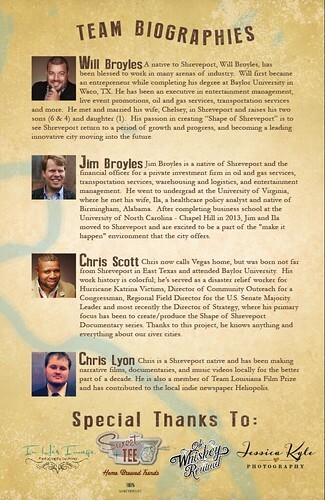 What stories will be told by the filmmaking team assembled by Will and Jim Broyles in the Shape of Shreveport series, making a debut on Thurs at the Strand Theater? It is "a 20-episode series about the inspiring, encouraging, and sometimes mysterious history of Shreveport." "We have involved many local historians, musicians, and experts to help tell the stories that shaped the Red River area," says Jim Broyles. The first four 15-minute episodes will air at the premier, touching on topics like the yellow fever epidemic, the cultural significance of the Louisiana Hayride and Shreveport's role in Dr. Martin Luther King Jr.'s social and political prominence. The Broyles brothers are aiming at a production "at the level of a History Channel series," says Jim. Scions of a local family successful in business, the Broyles are well educated, well traveled and deeply invested in the present and future of Shreveport. "We're starting a conversation about our town with these films," says Jim. "So we can understand where we're coming from and think about where we're going." Tickets: $20. An all ages event, there will be kids' activities and history book signing prior to the movies. All proceeds go to the Strand. BTW, seating is reserved. Strand tickets: 226 8555. "Getting ready to open my studio‬ on Sunday," says artist Su Stella. "Come by for a henna tattooooooo, new art, or paint a gourd... We open at 11 and will sell art until 4." 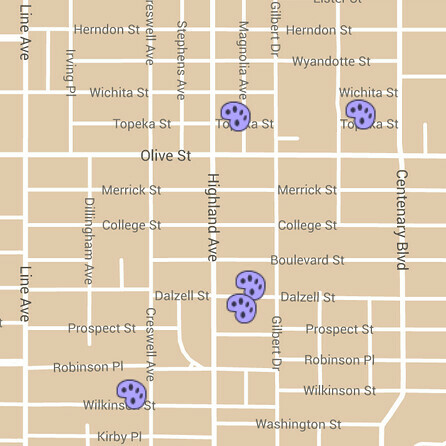 She adds, orientationally, "Start the tour at 436 Topeka in Shreveport; pick up a map and enjoy a ramble across the fascinating neighborhood called Highland." "Six locations this month. 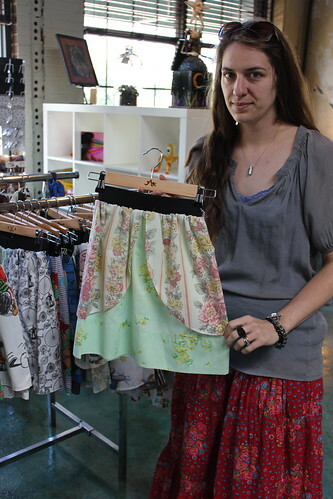 Meet artists in their studios and see and/or buy art," says artist Kathryn Usher. "It's a self guided tour. Drive, walk or bike. 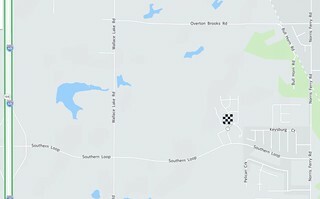 Maps are available at each location." 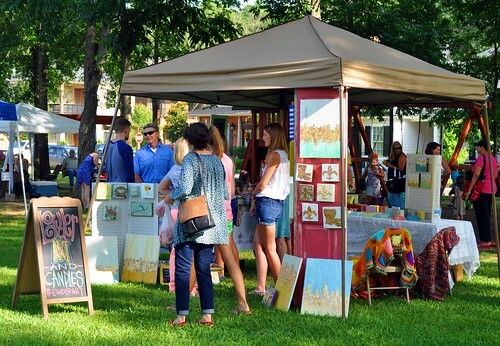 Historic Highland neighborhood is an official Louisiana Cultural District; there is no sales tax for original art purchases.